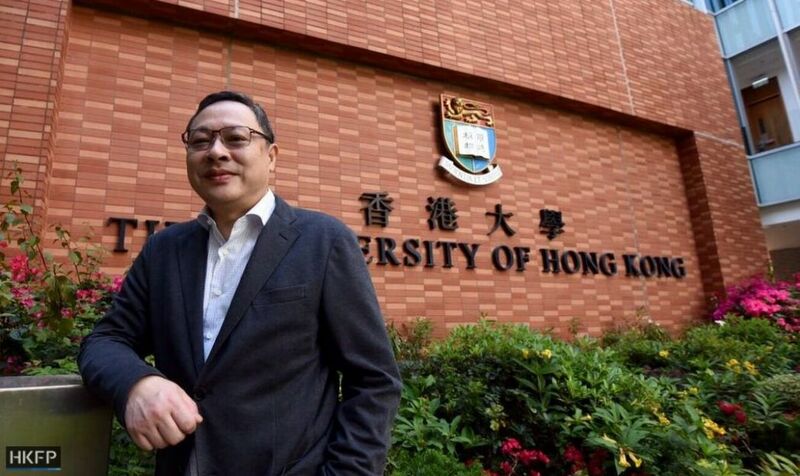 Despite his critics’ calls to have him fired, law professor Benny Tai is relaxed about his own future. But he is very concerned about Hong Kong’s future. He believes that the recent attacks against him by the local and Beijing governments were not only attempts to limit his freedom of expression, but part of a grand campaign to brainwash Hong Kong people under China’s new constitutional order. “What I have done is to encourage people to have critical thinking – and I think that’s what they do not want [Hongkongers] to have. Just accept how good China is, all the contributions of the Chinese Communist Party, how great President Xi is. All of this is trying to brainwash Hong Kong people,” he told HKFP on Tuesday. One way to achieve this goal is to discredit anyone who encourages critical thought, Tai said, with his trademark cheerful grin. 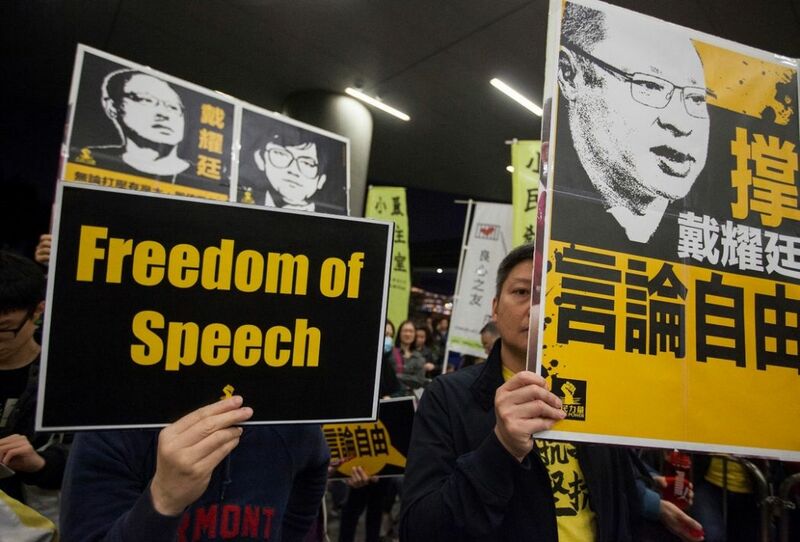 A wave of recent attacks against him unleashed by the Hong Kong and central government, the pro-establishment camp, and Chinese state media have sparked fears over Hong Kong’s academic freedom and freedom of speech. But the controversial University of Hong Kong law professor says that the incident fits into a bigger ongoing narrative, where students, journalists and other members of civil society are expected to be patriotic and to embrace one-party rule, and the unlimited rule of Chinese President Xi Jinping. “When I say that we should be critical, we should think about what may happen in the future, [if] that future is a future quite different from the future designed by the Communist Party. We are talking about the end of the authoritarian rule,” he said. Benny Tai. Photo: Catherine Lai/HKFP. Tai’s most recent troubles began with a speech at a forum in Taiwan hosted by an anti-Communist group about the human rights of ethnic groups in mainland China and Taiwan. The event on March 24 was attended by activists and scholars covering issues relating to mainland China, Tibet, Xinjiang and Inner Mongolia. In his two-minute concluding remarks, Tai said people should engage in a thought experiment: What if China’s authoritarian rule collapses? If this happens, Tai said that people should have the right to self-determination, and – at that point – options could include each ethnic group forming independent states, becoming part of a federal state, or part of a confederation. It was not the first time Tai had made such remarks. 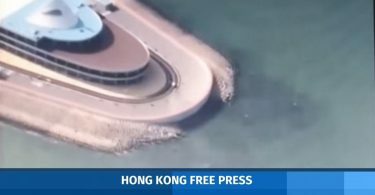 In a swift response, the Hong Kong government issued a rare statement saying it was “shocked by the remarks made by a university teaching staff member that Hong Kong could consider becoming an independent state.” Beijing’s Hong Kong and Macao Affairs Office and the pro-Beijing press joined the chorus of condemnation. Two weeks into the controversy, Tai sits calmly in a tiny corner office filled to the ceiling with books on law, politics and religion. He had just returned from another interview, where he posed for photos as passing students stared at him – perhaps recognising him from the news. Far from a ranting activist, Tai often rambles – like any true academic – as he gathers his thoughts in real-time. At a tent in Admiralty, Benny Tai catches up with the news in the final days of the 2014 Umbrella Movement. File photo: Tom Grundy/HKFP. Sat next to a photo of the Umbrella Movement’s first anniversary rally, Tai says that Beijing has been repeatedly pushing “red lines” which Hongkongers should not cross in recent years. From attempts to ban Hong Kong independence advocates from election, to condemning advocates for self-determination with independence as an option, to – most recently – attacking those talking about the possibility of potential independence after the Party’s hypothetical collapse. He said he was unable to offer an explanation as to why he was targeted so fiercely this time, except that it was perhaps easier for Beijing to “cook up the matter” because he spoke in Taiwan at an anti-Communist event. Tai, calling himself an interdisciplinary scholar, said people must continue to think out of the box, and not let themselves be limited by red lines drawn by the Communist Party. Tai said although the pro-democracy camp, who supported him throughout the incident, were against the suppression of freedom of expression, they were very careful in setting the tone of their support. 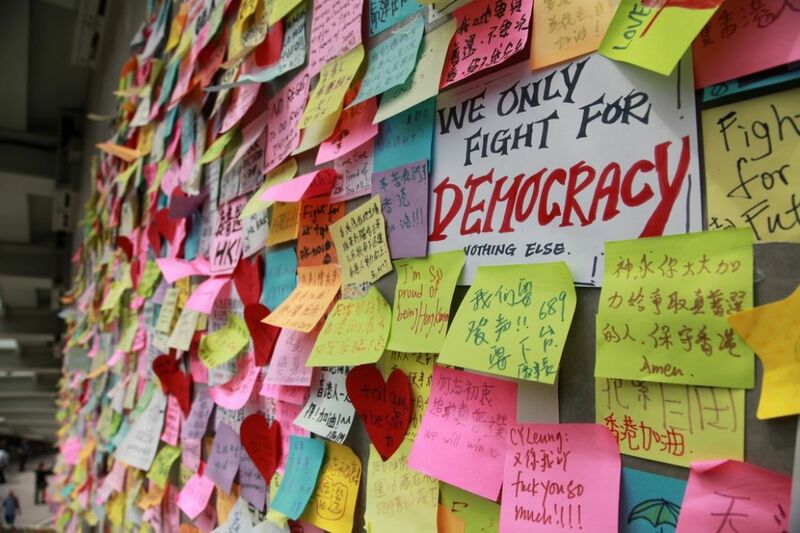 The University of Hong Kong’s student Democracy Wall notice board. 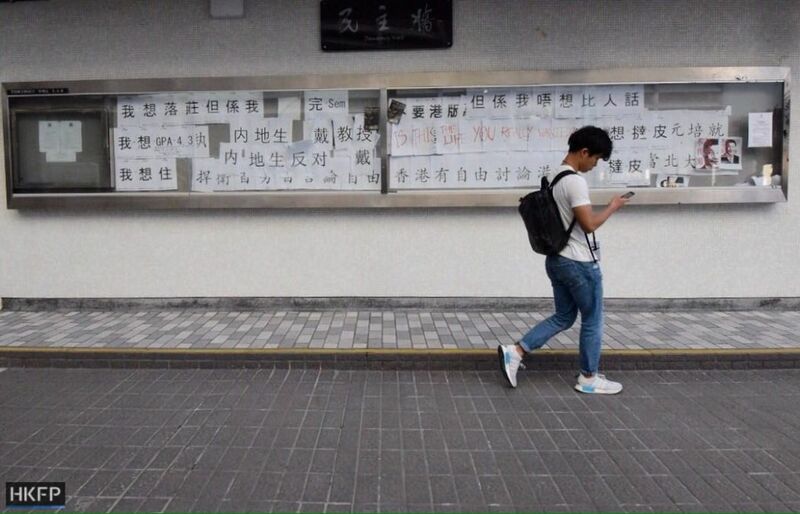 On the left: “Mainland students against Professor Tai.” On the right: “Hong Kong has the freedom to discuss independence.” Photo: Catherine Lai/HKFP. “They are not supporting my stance on the future of China and Hong Kong. Also I think in some [statements] of the political parties, they make it clear they do not support independence of Hong Kong,” he said, adding that he does not support independence either. He is also leading a coordination plan for the District Council elections next year in an effort to attract 300 pro-democracy candidates to run and maximise their seats. He said Beijing may wish to discourage activists to work with him by labelling him as an independence advocate, as they may then fear being barred from election for associating with him. He also warned of a return of Hong Kong’s controversial national security law, with much stricter provisions, whereby mere speech could be punished. Tai said the harm to academic freedom has already been done, as scholars are subjected to a chilling effect. Tai was the founder of the original pro-democracy Occupy Central campaign to demand universal suffrage – envisioned as a peaceful carnival-style sit-in in Central. But the protests in 2014 unexpectedly transformed into the 79-day Umbrella Movement, started around Admiralty, after 87 tear gas canisters were fired at protesters. Tai went to Harvard University in June 2015 for a workshop on negotiation and conflict resolution, months after the movement failed to win concessions on universal suffrage from Beijing. He had to accept the city’s undemocratic system would stay in place for some time. “During my time at Harvard, I was at a very depressed state for more than half a year. At that point, I suddenly have some kind of breakthrough, and I thought that we cannot look at the present,” he said. Tai’s projections for future scenarios are in fact part of a new book Tai was planning, partially inspired by China’s Future, a 2016 book by George Washington University political scientist David Shambaugh, which discussed potential possibilities for China. “He talked about [how] China may be at a crossroad. 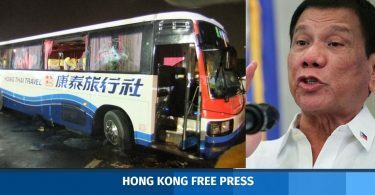 I used a similar kind of metaphor – I would say Hong Kong may be also at a crossroad, and also the two crossroads may cross each other, so they are in some way connected,” he said. Tai said he was calm and unafraid of losing his job over his writing. Arthur Li, chair of his university’s governing council, has said it would be difficult for the school to start disciplinary proceedings, unless Tai was found to have committed a legal offence. “I think I will be safe until the time I am convicted by the court. Actually the time is near, because my case concerning Occupy Central will be heard by the court in November this year, and [it’s] likely that early 2019 will have the judgment,” he said. 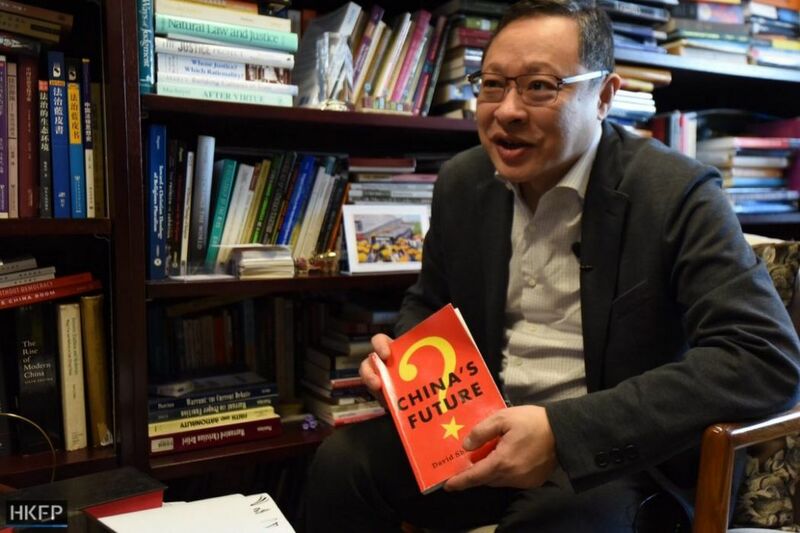 In his draft of the book, he explained that Chinese people tend to look at history for solutions, instead of having a mindset of looking to the future. He said Hong Kong people, most being Chinese, inherited this characteristic, including his own students. He challenges his students to debate him if they disagree with his ideas. Tai said he has Beijing to thank for attracting wider interest to his speeches and articles.